George Ethelred Jenoure was born on the 28th June 1896 in Sledmere, East Yorkshire the son of James Stanhope Jenoure (1861-1947) and his wife Ada Isabel (née Houghton, 1857-1929). His grandfather, Reverand Henry Courteney Jenoure (1825-1899), was the Vicar of Burton Joyce, Nottinghamshire between 1863 and 18772. His mother had become deaf at a very young age, was also speech impaired and had attended a school for the deaf in Birmingham where, later, she met and married James Stanhope Jenoure3. Although the family had lived briefly in Beeston and it is likely to be where George received his education, his father took teaching posts in various parts of England and was often absent. By 1901, his mother and two of their four children were boarding at 24 Gladstone Street, Beeston, Notts and was working as a lace curtain machinist, probably at Anglo Scotian Mills. Her husband, who was then working as an assistant teacher, was a visitor4. By 1911, George had found a position as a train recorder with the railway5 and his mother had moved to 52 Burns Street, Nottingham to live with her then married daughter's family6. Sometime before the outbreak of war in August 1914, George had joined the Royal Navy and was, at the outbreak, an Ordinary Signalman on board the armoured cruiser HMS Good Hope (shown right). When built in 1901, she was among the fastest ships in the world but, sadly, as it faced its first - and final - test of the war, it was largely obsolete and under-armed and no match for the more modern German armoured cruisers it was to encounter. Good Hope was then part of a squadron under the command of Rear-Admiral Sir Christopher Cradock, patrollling the South Alantic. Good Hope was Cradock's flagship with the armoured cruise HMS Monmouth, HMS Glasgow and three other light cruisers, the converted liner HMS Otranto and two armed merchantmen making up the remainder of the Squadron. While each of the armoured cruisers had a large number of 6 inch guns, only Good Hope had heavier artillery - two 9.2 inch guns - that would be anywhere near adequate for facing a serious enemy force. That was the position, on October 5th when Cradock was advised of the apparent intention of Vice-Admiral Maximilian von Spee to divert his German East Asia Squadron to attack shipping along the trading routes along the west coast of South America. This German Squadon included the crack German ships, Scharnhorst, Gneisenau, Leipzig, Dresden and Nurnberg, manned by experienced crews and equipped with overwhelmingly superior armaments in terms of both range and fire power. Cradock's difficulties in taking on the enemy were compounded when requested reinforcements were not forthcoming. Faced with overwhelming odds, Craddock nevertheless decided to engage the enemy. In the ensuing encounter, on November 1st 1914, known as the battle of Coronel, two British ships were sunk by gunfire from the German Armoured Cruisers SMS Scharnhorst and SMS Gneisenau. The first to be hit, Good Hope caught fire, broke apart and sank within half an hour and all 975 officers - including Rear Admiral Cradock - and men were lost. Ordinary Signalman Jenoire was among those lost. Within two hours, the Monmouth was badly damaged and eventually sank, bringing the total lost in the engagement to over 1400 officers and men7. Those who died in the Battle of Coronel are remembered on a memorial that stands in 21st May Plaza, Coronel, Chile (shown right). A memorial plaque to those who died in the Batle of Coronel can be found in Christ Church Cathedral in Stanley, Falkland Islands8. George's older brother, Arthur Stanhope Jenoire (b. 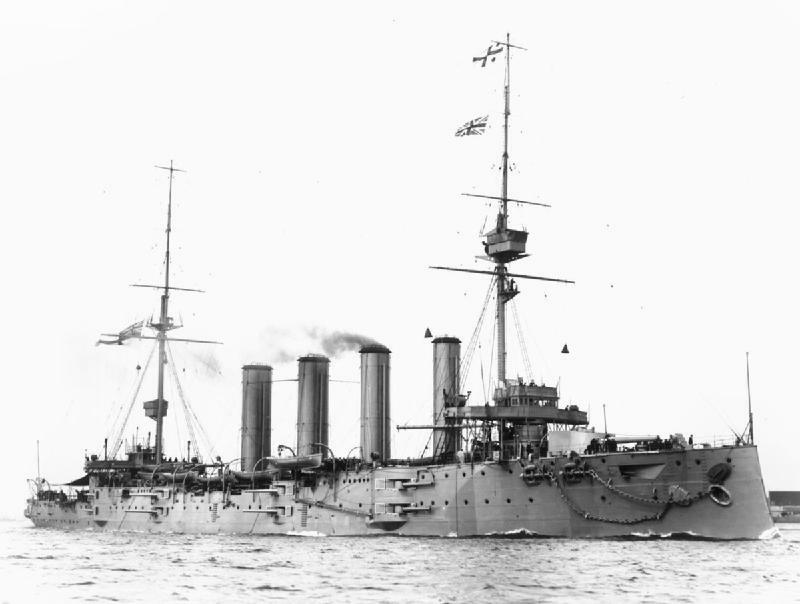 1893), who had joined the Royal Navy as a boy, also died in the Great War when his ship, HMS Hampshire was sunk on 5th June 19169. 3They married on 25 July 1881 at St Gabriel's Church, Deritend, Birmingham (Marriage Register). 7Details of the Battle of Coronel can be found at http://en.wikipedia.org/wiki/Battle_of_Coronel and many other websites. 8Details are on the excellent website http://www.coronel.org.uk/ which serves as an online memorial to the battle. 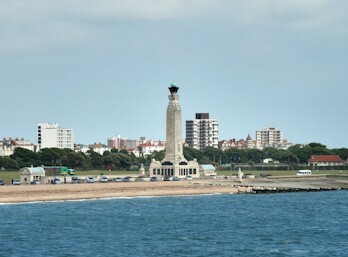 The photograph of the memorial in Chile, taken by Tristan McGrath, a descendant of a crew member of HMS Monmouth, is from that site.